Actually, they’re more than alright. They’re taking the Windy City by storm. Even more than this winter storm we’ve got going on right now (the flakes are massive). 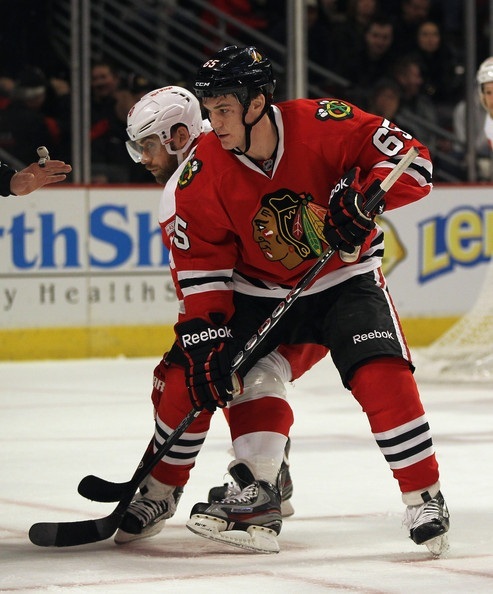 Andrew Shaw, 20, and Jimmy Hayes, 22, both came up from Chicago’s minor league affiliate Rockford IceHogs to help the Blackhawks and their injury depleted lineup (Marcus Kruger, concussion; Daniel Carcillo, knee surgery; Patrick Sharp, wrist). Normally, when a younger guy comes up to help the team out, they’ve filled a hole on the roster and helped out minimally in terms of ice time, especially with guys like Toews, Kane and Hossa chewing up quality minutes. But oh, how the times are a-changin’. In just 10 games with the Hawks, Hayes has put up 7 points (4 goals, 3 assists), not to mention scoring his first NHL goal in his second career game against the Edmonton Oilers on January 2. Oh yeah, and Joel Quenneville trusted him enough to take the team awarded penalty shot (he missed). He’s a BIG guy (6’6″, 220 lbs), and fills a Byfuglien-esque hole that the Hawks have had for quite some time. He’s a fast skater, quick hands, and DUH he’s massive. Did I mention he’s from Boston? And then there’s Andrew Shaw, who’s so talented he hasn’t even posted his first NHL assist yet. He has 5 goals in 8 games, and has been rewarded by playing a penalty killing unit with Captain Sexpanther. He even scored his first NHL goal, on his first shot, in his first game against the Flyers on January 5 (same as the Cap’n). Shaw also dropped the gloves with Zac Rinaldo of the Phildelphia Flyers in the first period of his first NHL game. He’s a stud, this guy, and he’s 20. My age. I never want to mention successful people my age in front of my parents because I fear they’ll yell at me for watching too much “Ellen”. Sorry I’m not a very good hockey player, guys. Plus, he’s taking Twitter and Chicago by storm. Ladies and gentlemen, say hello to “ShawFacts”, otherwise known as reasons why Andrew Shaw is a bada$$. Go ahead and read a few compiled by Blackhawks writers on their website by clicking here. They have a definite Chuck Norris feel to them. UPDATE: I forgot to add this earlier, and not many people realize this, but Andrew Shaw was passed over in not one, but two NHL drafts, until finally being selected in the 5th round. Talk about a steal. It just goes to show what a quality minor league system the Blackhawks have. President and CEO John McDonough said he wanted to develop a “Blackhawks Way” of playing hockey and front office methods, and they’re following through. These guys have come up and made their presence known so much, that no commentator or pundit has said, “I wonder how the Blackhawks would be playing if Sharp and Carcillo were healthy.” These kids are just that good. So, hockey fans, let’s enjoy their presence here while we can, and I know we’ll see a lot more of them in the future. Plus, in a post-game interview, Patrick Kane said he loves hanging out with both of them, and that Hayes’ accent is his favorite part. Who doesn’t love a good ol’ Boston boy? PS Tonight the Hawks are hosting the Florida Panthers. Aka Brian Campbell, Tomas Kopecky, Jack Skille, and Kris “Beauty” Versteeg will be in the building. I’ll definitely be watching the game, will you? Gotta love how small the hockey world is, eh? “Captain Sexpanther” – I just peed a little!